This recipe is from Mom's Big Book of Cookies. These never last long at our house!! Preheat oven to 350*. Combine flour, baking powder, salt. Melt butter in a medium saucepan over low heat. Remove it from the heat and stir in brown sugar with a wooden spoon until dissolved. Stir in espresso powder. Whisk in egg and vanilla extract. Stir in the flour mixture until just incorporated, then stir in half of the toffee bits. Pour batter into 8 inch square baking pan. Bake 25-30 minutes, until set in center. Immediately scatter other half of toffee bits and press down lightly with back of a spoon so they adhere. Let cool completely before cutting. Yum! My hubby would love these...need to make some up for him! :) Thanks! Thanks for stopping by! 72 acres? oh that is the dream for sure. We are working on getting our farm up and running, trying to get as useful as possible. I also like to write creatively and will be doing some "creative observation" on WednesdayIt really is an exercise of the soul. I look forward to living vicariously near the ocean, we have the desert in AZ, tumble weeds, cactus and cyotes.!! These brownies look delish. I also read your story of the acid reflux and became a fan of yours. Plus, the bird in the house was pretty funny. I have run 2 half marathons and walked a full marathon in Hawaii. This was several years ago. I've thought about doing another half, but can't find someone to run with me. If you lived here, I would ask you, but than again, I run at a turtles pace, but I finish. Following your blog now. Wow, Heath Bar and coffee in them! These look amazing!! 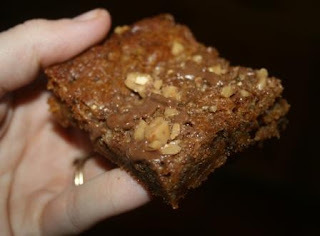 A nice different take on regular brownies, a grown-up version for the adults!! So classy, they would be good for a bridge club or lunch with the ladies. My hubby would love them too. PS -- Thanks for your nice comment about him. Mmmm those wouldn't last long here either! Thanks for the recipe! Yummo! These would disappear quickly at my house, too! My wife makes Blondies, but not like this, sounds Yummmiiieeeeee. Blondies are sooo delish.. keep them away from me, okay? Those sound so very yummy!! Thanks for sharing! Holy cow! This looks like one of those things I should give up for Lent if I gave stuff up for Lent! I just read this & thought... I quite possibly could be in love! I have got to give this a try!!! Oh my! Looks like I will be baking this week.